I love salisbury steaks and it is comfort food at its finest. You create this delicious meat patty that gets those nice crisp pan seared edges and tender center. But my favorite part is the rich brown gravy that you create with mushrooms and tender onions. The meat is just drowning in this delicious sauce begging you to serve it over some mashed potatoes. For more delicious steak recipes try either Skillet Garlic Butter Herb Steak and Potatoes or Garlic Butter and Herb Steak Bites. I have had to get creative with meals lately because we are so busy. I need something that is easy and requires little clean up. 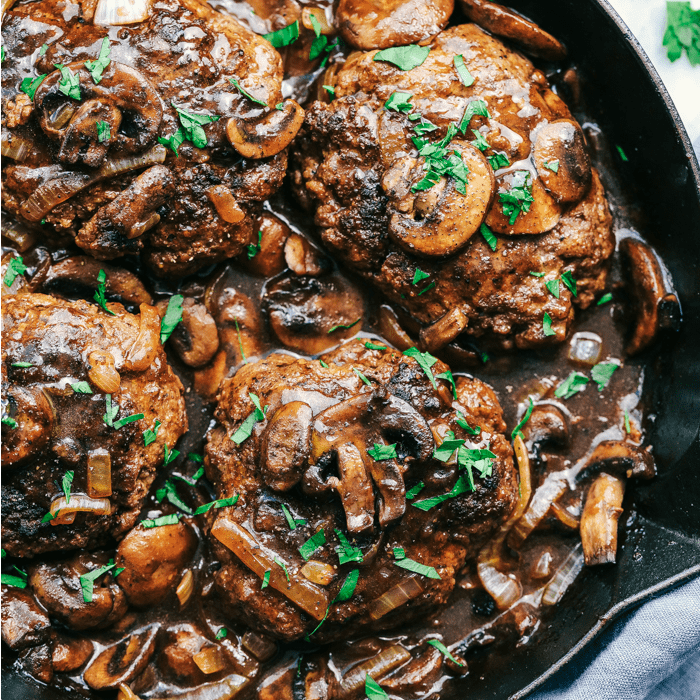 It is so nice to mix it up from a chicken dish and have these savory Salisbury steaks that are drowning in a rich brown mushroom and onion gravy. Oh my goodness you guys are going to love this recipe so much. It is ready in just 30 minutes and it is sure to please the entire family! You are going to want to make this again and again! 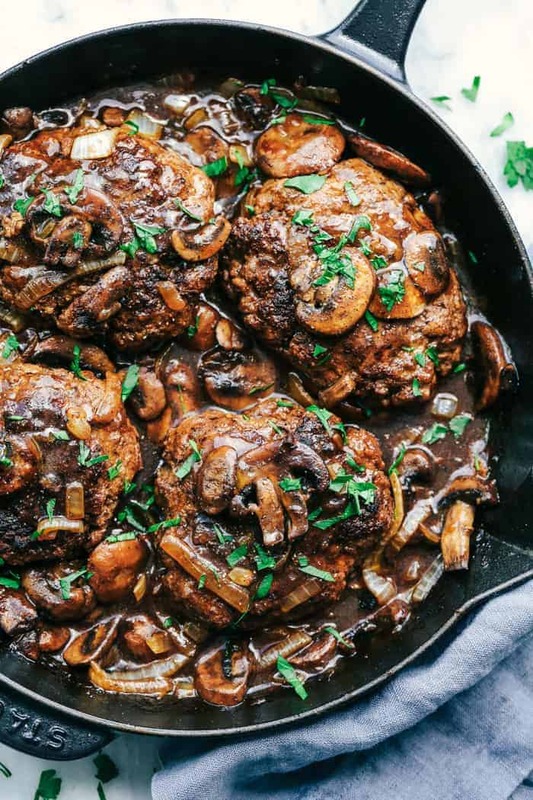 How do you make Skillet Salisbury Steak? In a medium sized mixing bowl add the ground beef, bread crumbs, ketchup, Worcestershire sauce, mustard powder, egg, and salt and pepper. Mix with your hands until just combined and shape into 4 oval patties. Heat the butter in a medium sized skillet over medium high heat. Add the patties and cook until the sides are slightly crisp and cooked throughout. Remove and set aside on a plate. Add the olive oil to the pan with the mushrooms and onion and cook until tender. Set aside on a plate. To make the gravy: Add the beef broth, ketchup, worchestershire sauce to the skillet. In a small bowl add the cornstarch and water creating a slurry. Whisk it into the gravy and bring to a boil. Reduce the heat to medium low and add the mushrooms, onions, and patties back to the skillet. Allow to simmer until the gravy starts to thicken. Salt and pepper to taste. Serve over mashed potatoes and peas and garnish with fresh parsley if desired. Salisbury Steak is a dish that has been around for years. It is a famous dish that is simple to make with loads of flavor. It usually consists of a homemade hamburger patty smothered in a rich and flavorful brown gravy served with noodles or mashed potatoes. 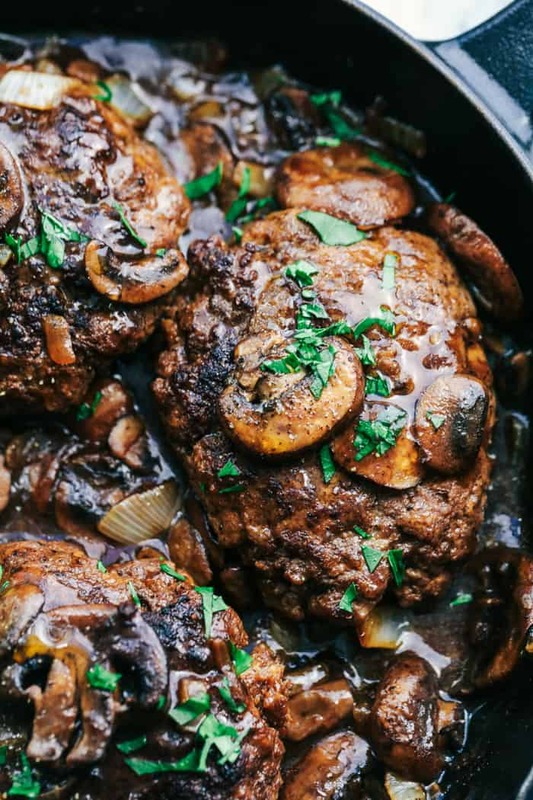 Our family likes to add in mushrooms or onions to the brown gravy for extra flavor! Can you bake Salisbury steak? Yes! Combine all the ingredients for the Salisbury steak. Place the steak patties in an oven safe pan or skillet. Pour the gravy over top of the steak. If you would like to roast your vegetables at the same time, add them into the pan with the steak and gravy. Cover and bake at 350 degrees for 30 to 35 minutes or until the meat is no longer pink. A Salisbury steak contains more fillers such as breadcrumbs, sauces, onions and an egg whereas a hamburger steak only contains salt and pepper. They are very similar and may not have a difference at all depending on the recipe itself. Hamburger steak is usually served with a hamburger bun or a type of bread. A Salisbury steak can be served on its own or with other sides to make it a meal. They are very similar and cooked the same way when cooked with a gravy mixture. What is great to serve with Salisbury steak? I love to serve Salisbury steak with potatoes, noodles or even rice. To make this into a great family meal add in some vegetables like green beans, peas, roasted cauliflower or carrots to bring in some color and extra flavor. These have been our favorite family potatoes. Looking for Steak Recipes? Here you go! This looks extra fabulous. Can’t wait to make it. Tomorrow! I have been looking for a Salisbury Steak recipe. This spunds so good. I can’t wait to try it. Thank you for giving us this recipe. I add garlic, more onions, & mushrooms used only 2 cups of broth made a roux to thicken the gravy delicious! Cograts on your new ? girl! I like one skillet recipes and this looks good. I too like a little thicker gravy though and I also boost my beef broth with some beef base. Hi I just subscribed to digital Washington post as I love your recipes…although I am having trouble printing….if I subscribe to your blog will I be able to print as printable format..
My family loves it. I cooked this for dinner. I was worried that we did not have mustard powder and no mustard either. It still tasted good. Anyway, I doubled the recipe so that we can reheat it for tomorrow’s dinner. My husband and daughter like it a lot. Thank you so much! Your salisbury recipe is so easy to follow and delicious too! Easy and tasty. Great combination! Thanks for sharing your recipe! Absolutely Delicious! I doubled the cornstarch. Other than that, this recipe is perfect. Thank you so much. 5 Stars! The best recipe that I have found for this dish, EVER!! A must try! I’m wanting to try this out but I’m not sure if I’m suppose to use lean meat or no? G’day from Down Under!! This was super easy and so delicious….now bookmarked and a go to recipe for future weekday meals! Thanks. 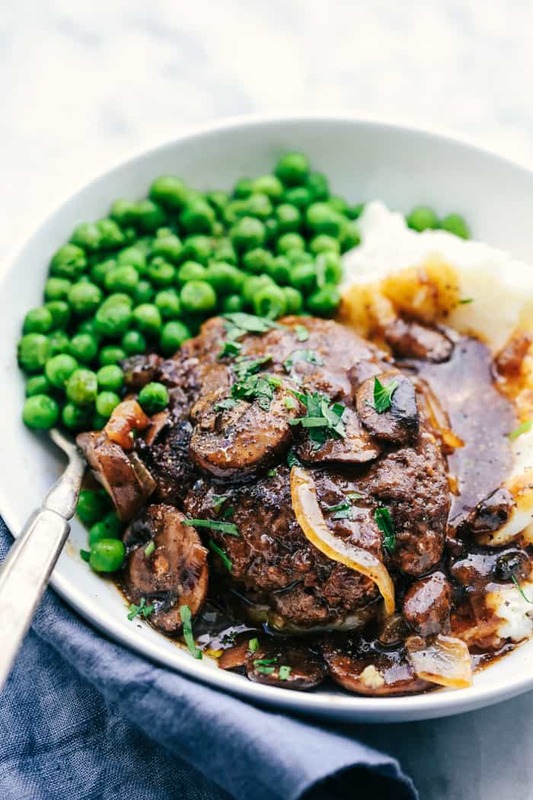 Although Salisbury steak is definitely a great comfort food, it is something that I have never tried to make. This recipe is so basic and sounds so very easy to make that it is definitely on my list of things to try to make this coming week. I also took down your ribeye marinade as we have been looking for a substitute for McCormicks since they no longer sell it. Everything that we’ve seen on this sight is so beautiful and so simple that we’ll definitely be coming back again to see what other good ideas you can provide. Many thanks. Why rate a recipe that ”sounds good”??! I made your Salisbury Steak in a Skillet, and it was fabulous! It also offered other benefits in the heat was, in that the oven took no part in the act! My husband liked it and so did I even more that the beloved Salisbury steak I used to cook in the over. Will never cook it that way again. What great flavor and juiciness!! Abolutely amazing!! My little girls called this “Mushroom Meatloaf” and it’s now a family favorite! I do a low-and-slow simmer on mine with extra onions, garlic and mushrooms and it takes about 1.5 hours to bring to the table. I’ve used organic beef concentrate with this instead of the stock, as I ran out, and I think it tastes better! This is a great recipe. It’s in my “favorites” folder thgat sits on the countertop! I made this tonight for dinner, was a big hit. Thanks for sharing the recipe. I’ve made this several times now and it’s become a huge family favorite that’s earned a spot on my normal dinner rotation. The flavor is absolutely amazing! Now I always make at least a double batch because, if this is even possible, the leftovers have an even better flavor. My only tweak for my family’s palate is omitting the worchestershire in the gravy, but I leave it in the meat mixture. Honestly, this is one of my favorite meals ever!!! Thank you! Hands down this recipe is delish! I did read through the comments and added 1 Beef bouillon cube, and an extra tablespoon of cornstarch and water mixed. My husband is normally the Chef of our house, but since i made this dish, he thinks i should cook from not on! I love that you post every day supper recipes. 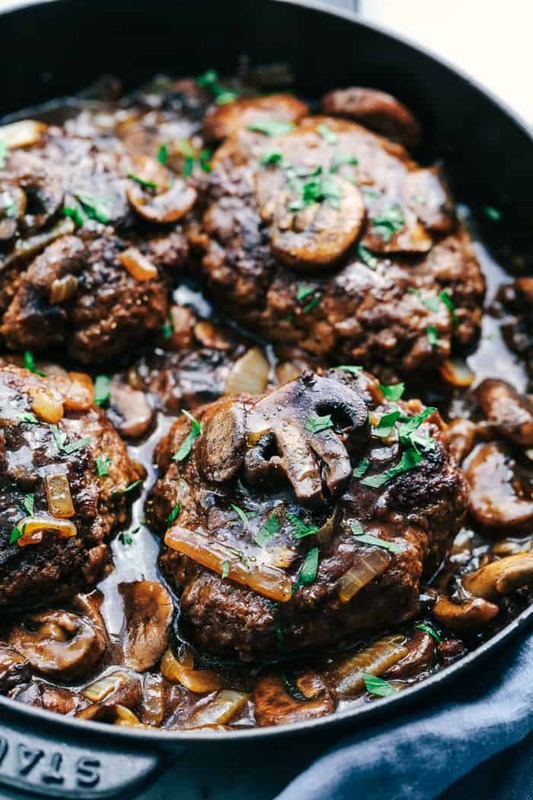 The Salisbury Steak recipe and picture look delicious! This will be our supper tomorrow evening. I’ll let you know how much my husbands likes it. I know he will! Thank you for the recipes. It’s nice to make a change and not have it cost a small fortune. This should come it at less than $10 for 2 meals, twice. Can’t go wrong with it. I made your recipe for Salisbury Steaks last week. I found it very easy to make and the patties can be made ahead of time and frozen or put in the fridge for supper the next evening. My husband grew up on comfort food and the cheaper the better with 5 children and Mom and Dad to feed. I highly recommend this recipe to any doubters. My husband loved it!!! I have dietary restrictions but I scraped the gravy and mushrooms off and ate a patty. So 😋 yummy. I give it 5 stars 🌟🌟🌟🌟🌟! This was absolutely wonderful! Thank you for a keeper recipe! I made this as written except I didn’t have any cornstarch, so I used flour. It was delicious. My husband loved it. It made 2 meals for us. Will definitely make this again. This recipe was very easy and quick to make. Steaks were very tender . The only thing I would change when I make it again, is I would not put the ketchup or worchestershire in the gravy. I prefer brown flavored gravy and those ingredients changed the flavor too much. Definitely plan on making it again.